I have procrastinated over this post for too long now, having been caught up in the symbolism that this will be my 100th post on this blog. It is of course just another number, and when you get to my age, some numbers cease to have any real meaning – honest. But my 100th post. And I thought I’d celebrate by doing something a little bit different. Yes, I am going to break free from my stereotype and cultural boundaries and try to write a post that is not all doom and gloom. I think I might need a long lie down later. So, where can we find this good news? Well, this morning the Scottish Retail Consortium’s latest sales monitor for Scotland is headed “Slow but steady growth in May” and does tend to show some sales boost and hints at some rising sentiment from Scottish consumers and retailers. Not great, but a welcome change. There has also been a steady trickle of material that has tried in recent weeks to move away from the focus on the negative. Rather than focusing only on the vacancies, recent work by the Local Data Company has begun to focus on what is trading. We’ve had some good figures this morning from Sainsbury, showing not all is problematic. Columns in various newspapers and trade press have begun to point to the businesses that are trading well and those that have succeeded despite the recession, the internet and the collapse of incomes, lending and confidence. And it is in that light that Retail Week recently ran a feature on a Zolfo Cooper report into the UK’s fastest growing retailers. How this list was derived is not the issue here; the full report can be obtained via Retail Week if you want to check methods, scope and the results in more detail. As the editor of Retail Week noted, in all the doom and gloom and single, double, triple recessions we often overlook the fact that some retailers are doing really well. But, as Zolfo Cooper point out, the ways in which they are doing this has changed as retailing has changed in recent years. An aggressive store roll-out programme suddenly seems so last year. The role of price and price perception – Aldi, Poundworld, Perfect Home and 99p stores are testimony to our changed circumstances. Will we return to the ‘good old days’? Doubtful but that does not mean there are not opportunities for retailers. The role of the internet and other channels – Ideal Shopping Direct and Charles Tyrwhitt show this. Again, these channels have changed us for good, and when done well provide exactly what consumers want. Brand rules – Cath Kidston, American Golf, Office and Aurum Holdings seem to show that customers like brands beyond the obvious and will seek out and reward those that provide that point of difference. You can put in your own mind what this might mean for Scottish retailing (and none of these top 10 are based in Scotland). We obviously have stores from many of these names (and internet penetration) in Scotland. It is valid however to ask how many more they will need in Scotland (the discounters perhaps excepted where penetration is an issue), but I doubt it is that many. So there are some rapidly expanding/growing Scottish retailers. Looking through the top 30 reinforces the same themes from above; price, multi-channel and brand commitment are key. 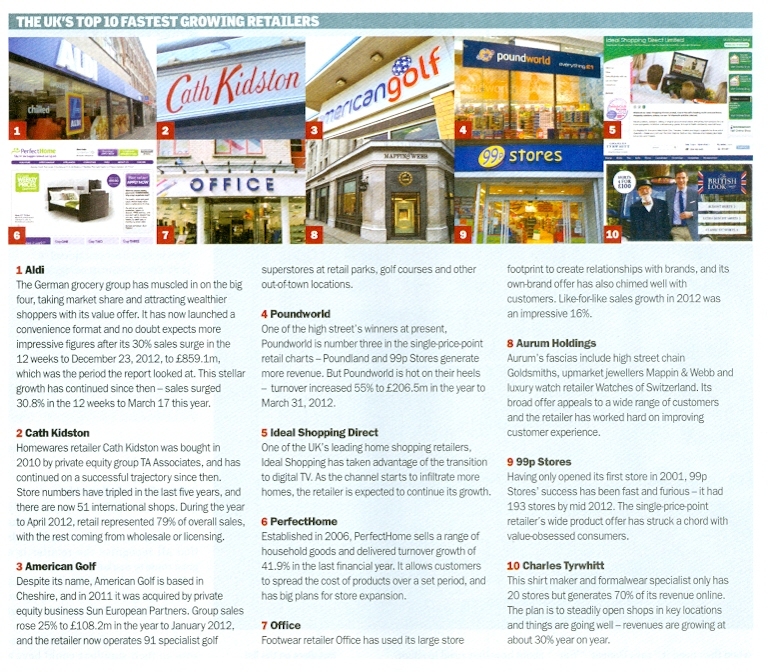 So which Scottish retailers have these and are the ones to watch? Answers please, on a postcard, email or even tweet. All this positivity can go to one’s head, so let’s finish being a 100 by pointing out that the gap between Scotland and the UK in retail sales in May expanded. We continue to underperform. There, I feel better already. This entry was posted in Consumer Change, Multichannel, Online Retailing, Pound Shops, Retail Economy, Retailers, Sainsbury, Scottish Retail Sales, Vacancies and tagged scottish retail consortium, Scottish Retail Sales; Retailers; Fastest Growing Retailers; Internet. Bookmark the permalink. 1 Response to Going Strong? Hmm… yes indeed this being positive thinking terrain is quite heady isn’t it? A really thoughtful and helpful reflection Leigh thanks. I find myself returning to something I posted previously – that the successful retailers seem to increasingly be those who combine (repeat combine) their online and offline offers into an almost single seamless experience. My three long-outstanding-and-never-even-acknowledged online enquiries made through the website ‘info@’ facility of high profile multiple retail chains remain unanswered and sitting behind the proverbial clock on the mantle-piece. These companies are each – there is no excuse or justification for such shoddy service. But! Staying on the positive; I also still see considerable scope for traditional (smaller) retailers in the traditional High Street to radically rethink , redesign and re-position their offer to provide the near-seamless combination off online and offline. These retailers could well turn out to be ideally placed for such a development.